Air New Zealand, Airline to Middle-earth, unveiled its latest The Lord of the Rings-themed aircraft on November 14 as it steps up its worldwide campaign to harness the tourism power of the motion picture trilogy. Acclaimed New Zealand landscape photographer Andris Apse has achieved the ultimate exhibition space - on the side of a Boeing 747-400! As the New Zealand world premiere of the final installment of the trilogy, The Lord of the Rings: The Return of the King, approaches, the airline rolled out its third themed aircraft to take the Middle-earth message around the world. The stunning design, which stretches 48 meters along the giant Boeing 747-400 fuselage, depicts the faces of stars Viggo Mortensen (Aragorn) and Orlando Bloom (Legolas) as part of the giant decal, and covers an area of 800 square meters. The third aircraft, which headed to Los Angeles for a photo-call with Viggo Mortensen, signals the start of an intensive Air New Zealand global marketing campaign to capitalize on the motion picture trilogy’s huge profile. On 2 August 2003, the U.S. Department of Homeland Security and the U.S. Department of State suspended the Transit without Visa (TWOV) program, which allows international air passengers to transit and travel through the United States without the need to obtain a U.S. visa. The suspension of the TWOV program will not affect U.S. and Canadian citizens or citizens from the following Visa Waiver Program (VWP) countries: Australia, Austria, Denmark, Finland, France, Germany, Iceland, Ireland, Italy, Japan, Monaco, Netherlands, New Zealand, Norway, Portugal, San Marino, Singapore, Spain, Sweden, and Switzerland. The PATA Strategic Intelligence Center has released two new reports dealing with, respectively, airline seat capacity and online ticket pricing. The new PATA Market Map: Airline Seat Capacity Trends to the PATA Region: 3rd Quarter 2003 report reveals airlines increased overall capacity to Asian destinations in the third quarter of 2003. “In terms of increases in net seats, Japan (624,000), Thailand (375,000) and Malaysia (264,000) led the PATA region in the third quarter of 2003,” PATA development director, Stephen Yong, said. The second report, E-Fare Barometer: A Profile of Electronic Air Fares from Germany to Ten Asian Destination’ assesses the competitiveness of Asian destinations in key tourism source markets by comparing airfares available to consumers through Internet travel portals. There are many tourist attractions around Chiang Mai, but nothing compares to a visit to the ancient city of Lamphun, the capital of a province which is only 26 km south of Chiang Mai. The town was founded in the 7th century within the fertile valley of the Mae Ping and borders the Mae Kuang in the east, which in turn flows into the Mae Ping further south in the west. The Queen Chamadevi memorial in Hariphunchaiya. Like Chiang Mai, which was founded by King Meng Rai in the 13th century, Lamphun has the remnants of an old city wall and a moat. The busy main street cuts the sleepy town into two halves. Towards the center is ‘Wat Phra That’ Hariphunchai, the holiest temple in northern Thailand. Being the town’s largest building complex, a 51m high golden spire dominates the relatively flat profile of Lamphun with its small side alleys, principal shops, the market and government offices. As most visitors arrive by bus from Chiang Mai along a yang-tree lined highway, they will enter the compound from the west side, though the main entrance is in the east, guarded by a pair of colorful lions. Queen Chamadevi of Hariphunchaiya with her twin sons, named Mahantayasa and Anantayasa. In the time of the Buddha, the Enlightened One predicted that 1200 years after his parinibbana or death (traditionally in 543 B.C. 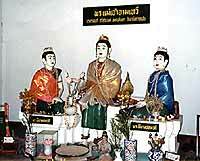 ), a great city named Hariphunchaiya would be established in the country of Samadesa or Muang Ping. By flying through the air with 500 disciples, the Buddha arrived at the west bank of the river and put down his alms bowl to mark the location of a chedi for several bone relics. 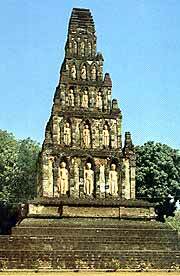 The step pagoda in Wat Chamadevi is built as a five-step laterite pyramid, showing Khmer influence with 60 standing terracotta Buddha images in niches in three rows on all four sides, dated to the 8th and 12th centuries respectively. An aboriginal Lawa hunter offered him a betel nut and therefore was to be reborn as King Adittaraja in the future. Before flying back to India, Buddha left a hair relic which was encased in an urn and placed in a cave south to where he sat. Consequently, the sacred place was guarded by a black crow until the coronation of Adittaraja in the 11th century who recovered King Asoka’s urn (King Asoka from India distributed 84000 relics in the 3rd century B.C.) and started to build the golden chedi. ‘Wat Phra That’ Hariphunchai, the holiest temple in northern Thailand. In the local tradition of the Lawa, the aboriginal people in northern Thailand, Pu Sae and Ya Sae were the cannibal parents of Ruesi Suthep, an eremite. When Buddha visited the area, they both had to stop their aboriginal habit of eating people and follow Buddha’s teaching instead. Their son even stopped eating meat altogether and became a vegetarian. While Suthep now lives as a spirit on Doi Suthep, his parents live nearby on Doi Kham, the golden mountain. The temple there was erected by Queen Chamadevi of Hariphunchaiya, who is also the guardian of the hair relic of the Buddha. Now, it is very important to know that Ruesi Suthep, with the help of some other eremites, founded the city of Hariphunchaiya in the middle of the 7th century in the form of a conch shell model in order to replace a city which had been washed away in a flood as the result of the misconduct of its king. Therefore, he invited his adoptive daughter who was born in a lotus to rule the new city. After having sent her on a raft down river to the king of Lavo, accompanied by 500 monkeys, the girl became a princess in Lavo (modern Lopburi) and was finally consecrated as Queen Chamadevi of Hariphunchaiya, seated on a heap of gold, also bringing back with her 500 monks and many more other professionals. After a long journey of seven months and seven days after reaching the city, she gave birth to twin sons, called Mahantayasa and Anantayasa. Later, both princes had to fight on the back of a magic elephant against one Milakkharaja and his 80000 soldiers. The Milakkharaja was the chieftain of the Lawa tribe named Vilangkha who wanted the civilized Mon queen for his wife, but was refused. He couldn’t even throw a spear from Doi Suthep into the city walls, because Chamadevi tricked him into wearing a hat made from her undergarment. She even went so far as to send him a gift of betel that the queen had secretly smeared menstrual blood on the leaves. Polluted by her menstrual blood, Vilangkha was finally killed by his boomeranging spear. Anyhow, as it came that Vilangkha had twin daughters, later both of them were married to her sons. As Mahantayasa was installed ruler of Hariphunchaiya at the age of seven, his twin-brother Anantayasa asked his mother for a kingdom of his own. 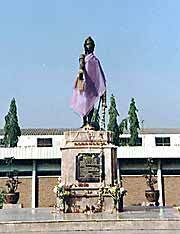 With the help of Ruesi Suthep and a hunter named Khelanga a new city was created (modern Lampang). After that, the queen mother visited Anantayasa in Khelanga for more than six years, living half of that time in a city of her own (Lampang Luang). Finally fallen homesick, she returned to Hariphunchaiya to die within two months at the age of 92 according to the Chiang Mai chronicle. After the funeral cremation of Chamadevi, her remains were placed in a golden urn and taken to the western outskirts of the city. Today, there are two chedis in Wat Chamadevi or Wat Kukut. One is built in bricks on an octagonal basis (Mon style), the other is built as a five-step laterite pyramid, showing Khmer influence with 60 standing terracotta Buddha images in niches in three rows on all four sides, dated to the 8th and 12th centuries respectively. From 1200 on, the Khmer military power disappeared in central Thailand and Lamphun’s golden time continued, before Khon Muang people under King Meng Rai conquered the town at the end of the 13th century (1281). King Meng Rai also brought Lamphun’s palladium to Chiang Mai, a crystal Buddha statue, which is now in a vihan at Wat Chiang Man. With the founding of Chiang Mai in 1296, the political influence of Lamphun was eclipsed, but the of Queen Chamadevi never ceased. The Thai government is to scrap the minimum charge set for passengers flying on budget airlines in an attempt to spur freer competition. Transport minister Suriya Jungrungreankit announced the move last week, saying that it would benefit passengers by allowing for cheaper fares, while encouraging more people to travel within Thailand. The abolition of the charge is likely to come into force next month once it has been approved by the Civil Aviation Committee. Currently the minimum charge is 3.80 baht (US$0.09) per kilometre. The transport minister said cancellation of the minimum charge would encourage private investors to compete in the country’s budget airline business. The move follows Orient Thai Airlines’ announcement that it would begin services from Bangkok to Chiang Mai on December 5 with its new low cost carrier one-two-Go. AirAsia, the Malaysian-based budget airline which is 51 percent owned by Prime Minister Thaksin Shinawatra’s family company Shin Corp, plans to offer the same service early next year. “Low-cost airlines will stimulate more travel within the country because people can travel when they have only a few days holiday,” said Suriya. He added that abolishing the charge would help to stimulate tourism throughout Thailand as more people took advantage of routes opening up to provincial airports.